Another short, sharp poem by Maltese author Immanuel Mifsud, taken from the collection Fid-Dar ta’ Clara (At Clara’s Place), 1998. The “Antarctica World Passport” shown in the photograph, designed by Ellen Gögler and Nadine Postel and made possible by Studio Orta, is available here. 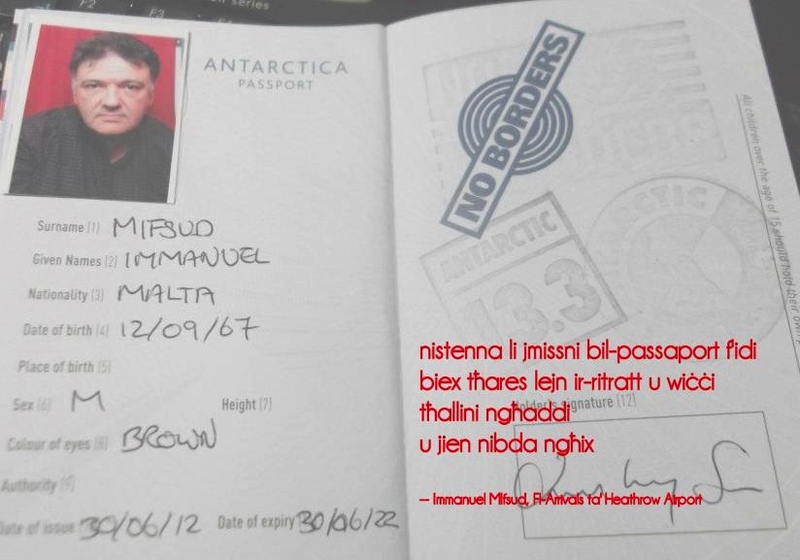 This entry was posted on 03/04/2014 by mondepasrondeditor in photography, poetry and tagged Antarctica, Antoine Cassar, borders, Ellen Gögler, Heathrow, Immanuel Mifsud, Malta, Nadine Postel, passports, Studio Orta, UK.